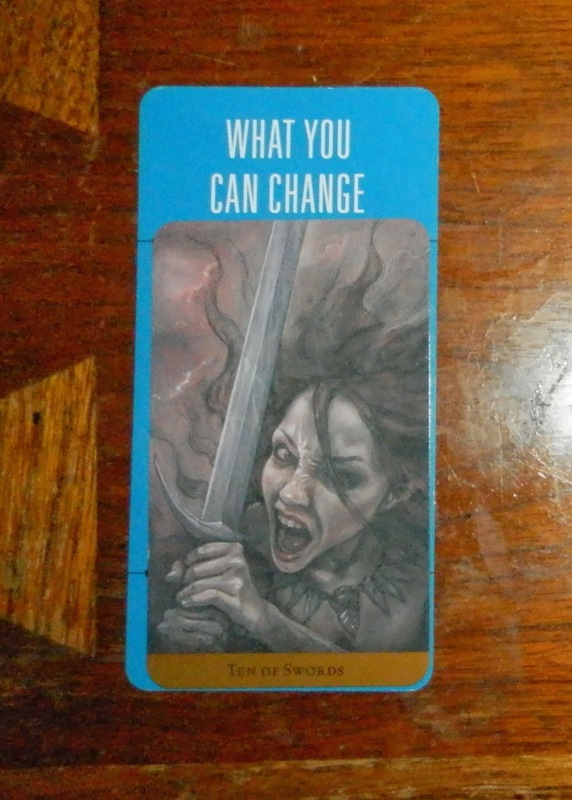 Today's Draw: 10 of Swords from the Tarot of the Hidden Realm in the What You Can Change position from the Deck of 1000 Spreads. Do you go into change and growth kicking and screaming? What can you think of to change that pattern this time around? Would making a contract or a list of action items help you? This week we're doing something different at The Daily Draw. We're doing a spread using my Deck of 1000 Spreads. Yesterday we determined the question for the spread—How can I make a growth a more peaceful process. So today marks the first answer in that spread. For the geeks out there, what I've done is I've gone through my Deck of 1000 Spreads and pulled out just the positions that seemed like they would be helpful in answering this question. And from those cards I randomly chose What You Can Change. This is the process I'll use all week. The Hidden Realm 10 of Swords pretty accurately pictures a normal way of going about growth—refuse to grow for as long as possible, then in a fitful huff, finally make the move you could have made months, if not years, earlier...haha. As Barbara Moore explains in the book for the Hidden Realm, Morrigan has had enough. And so she swoops down in a violent rage and puts an end to all the "should I or shouldn't I?" and other waffling that keeps us stuck. It's funny that this card came up, because yesterday I stated that I usually wait until the pain of growing is less than the pain of staying the same. Which is exactly what the Morrigan represents. In many ways, getting to the point that you go out in a blaze of glory or anger or whatever works. We know it works. Sooner or later the skin you're trying to molt becomes stretched so tight that it just bursts. But we didn't aks how to get to the end of our rope and change/grow as a result of pain. We want to grow more peacefully. And today's draw is saying that, in order to do that, we can't wait until the problem reaches 10 of Swords proportions. We have to be more proactive. In a way, it's the "grown up" way to go about things, right? It's not that the other way doesn't work, but it's all the wasted time and energy spent along the way. So instead, why can't we chart a course for change? Why can't we take baby steps in our growth and do something just a little differently today? In a couple of growth areas I'm attempting right now, I'm kind of doing that...taking baby steps. The change is moving along slowly, however. To pick up the pace, it occurs to me that I just have to move through my fears. That's what I'd end up doing in the 10 of Swords situation anyway, right? So why not just bite the bullet now? Or chart a more aggressive course for those changes that are harder to do all at once? I know I've found in the past that writing things down helps a lot. When you see it on paper with all the steps enumerated, it looks doable. It's more like running errands than altering the entire space-time continuum of my life. Sometimes we need to just grow the eff up and stop being a baby about the changes we face before it's too late, you know? What other ideas can you come up with to change the whole "wait until I can't take it anymore" approach to growth?